The occupation that nurses work most closely with is probably that of medicine. This chapter will look at how power affects this relationship. 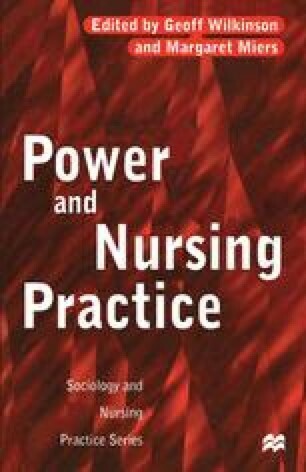 It will begin by attempting to describe the form that power relations between nurses and doctors take, noting that this is very variable. It will then go on to discuss some of the explanations that have been put forward about those relations. It will start by looking at explanations that concentrate on the market position of different occupations. Sociologists taking this approach are often highly influenced by the writings of Max Weber. The next approach to be discussed is that of feminism, which argues that gender, specifically the different gender balances within nursing and medicine, plays a crucial part in determining the relationship that exists between these occupations. Finally, those explanations which emphasise the important influence that wider economic structures have upon the position of occupations are addressed. The effect of the development of more flexible work patterns will form the kernel of this discussion.